EDVOTEK®’s M36 is a durable and seamless injection-molded horizontal agarose electrophoresis unit designed for ease-of-use and safety. It provides the maximum economy by hosting up to six lab groups on one apparatus. Included with the unit are six 6-tooth combs. The six 7 x 7 cm gel casting trays each have an embossed gel ruler and include rubber end caps which seal the trays. Both the electrophoresis chamber and the gel casting trays are UV transparent. 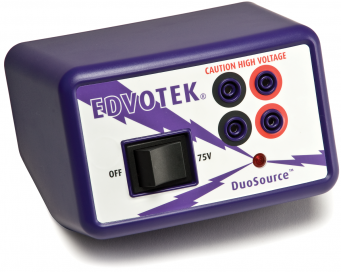 Designed for DNA or protein electrophoresis, the EVT 300 Dual Power Source is fully compatible with all EDVOTEK® electrophoresis units*. The unit generates DC power of 75 volts (for 1 or 2- M6, M12 or HexaGel units ) or 150 volts (for 1 or 2- M6/M12 units or 1 HexaGel Unit). The unit is equipped with an easily replaceable slow burn fuse and is constructed with all UL approved parts. EDVOTEK® Fixed Volume MiniPipets are precise and cost-effective. They utilize standard disposable 'yellow' micropipet tips. Please specify volume when ordering. The Midrange (280 nm- 314 nm) UV Transilluminators are designed to visualize DNA and proteins stained with fluorescent dyes. UV filter size is 7 x 14 cm. DNA- optimal visualization of EDVOTEK® experiment kits, utilising fluorescent dyes such as ethidium bromide, SYBR® Safe, RedEVu, GelRed and BluVu. Safety features include a UV-blocking cover and a power cut-off switch when the cover is opened. This waterbath includes digital control, a low-water sensor to prevent burn-outs and a deepened chamber to hold more bottles and flasks (14 x 15 x 10 cm). The stainless steel chamber is corrosion resistant and temperature controlled from ambient to 95°C with cover (included). This lightweight portable bacterial incubator (with carry handle) features a digital temperature control with a range from ambient +1˚ C to 60˚ C. Ideal for growing bacteria on agar plates at 37˚ C or for Southern and Western Blot analysis at 60˚ C. Includes two adjustable/removable shelves for increased capacity. Accepts bottles and flasks up to 2 L.
Ideal multi-use rack- suits 0.5, 1.5, 15 and 30 ml tubes.